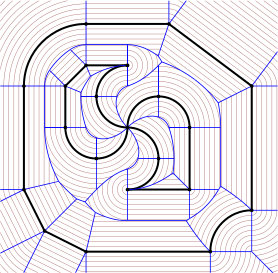 Martin Held’s VRONI is a C++ software package to compute Voronoi diagrams of points, straight-line segments and circular arcs in the plane. Based on the Voronoi diagram VRONI can also output the medial axis, offset curves or the maximum inscribed circle. VRONI originally supported points and line segments as input. As a part of my Master thesis I developed the extension ArcVRONI, which adds circular arcs to the list of supported input objects, see [HeHu09]. ArcVRONI is still the only industrial-strength implementation for Voronoi diagrams that can handle both line segments and circular arcs. Licenses for the commercial use of ArcVRONI are available via the University of Salzburg. Please visit Martin Held’s website for details on VRONI and ArcVRONI and how to obtain these software packages.